Getting braces, albeit life changing, doesn’t necessarily mean that you have to change your lifestyle. You do, however, have to be cautious about the foods you eat when you have braces. Or you could just get creative about how you eat those forbidden foods! When you have braces, it is best to avoid any foods that are sticky. This includes sticky, chewy candies, gum, tootsie rolls, toffee, caramel, and the like. The reason is that these foods can get stuck in the wires, which could end up pulling a wire loose or damaging the braces. You should also avoid candies such as jolly ranchers, ice, and even popcorn and raw nuts (they are too hard and can cause damage to the braces). No, that’s not all! Even hard to chew foods like bagels, hard bread, and pizza crust are a no-go for now. Notice we said pizza crust; the rest of the pizza is fine. Craving food with flavor that is south of the border? Just to be on the safe side, opt for soft-shelled tacos instead of the crunchy tortilla kind. Try to limit the amount of sugar, cookies, sodas, juices, and sports drinks that you consume to avoid developing tooth decay under or around your brackets. Of course, you probably are already limiting these things as it is, since it is better for your health, right? Other foods may be difficult to eat when you have braces, but that just means you have to get creative about how you eat them. For instance, if you want to eat foods like chicken wings or corn on the cob, just remove the chicken from the bone or the corn from the cob and enjoy it that way instead. Love crunchy fruits and veggies? You may find that slightly cooking them by roasting or baking them makes eating these healthy foods a bit easier and more comfortable on your teeth. Smoothies are a great way to incorporate healthy fruits and vegetables into your diet without having to chew them or risk damaging your braces. Make sure you are consuming a healthy diet. If you still crave nuts and the added protein that they pack, consider eating nut butter or even incorporate the nuts into your meals by using almond flour instead of regular flour. Also, you can cook nuts to make them softer. Add extra flavor to your favorite Asian dish by throwing in some peanuts or cashews. Having braces doesn’t mean you have to change your lifestyle. 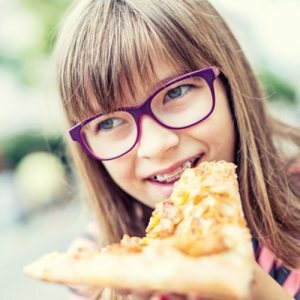 It just means you have to get creative about how you eat some of your favorite foods, although some foods are better left alone until the braces come off. In either case, be sure that you consume a balanced diet.